Upon entering the Studio Theatre, you find yourself looking at the liquid version of the lower stage, a man’s outfit layed out in it. The actors constantly have to wade through the water, lie or sit in it and use white boxes and their contents to switch between different parallel worlds (or not). The show is supposed to run 90 minutes (no Intermission), tonight it was still about 25 minutes longer than that. I can imagine that quick changes pose a special challenge with wet clothing. There was actually a moment in the first scene where main character George tries to get into his wet undies with rather limited success that caused some cackling in the audience. Cyrus Lane and Krystin Pellerin play several versions of their characters and manage the change seemlessly when they are supposed to. Michael Spencer-Davis and Gordon S. Miller’s policemen provide some comic relief while Sarah Orenstein doubles as witness to one of the crimes and the (sometimes) mysterious Penfield. Even if some things might need some tightening up and they should find a way to remove wet props before someone slips on them walking out of the theatre (one hell of a throwing arm on Miller there), the storylines were easy to follow and differentiate and I was particularly impressed by Lane’s portayal of his character’s journey and Pellerin’s different Joyces. 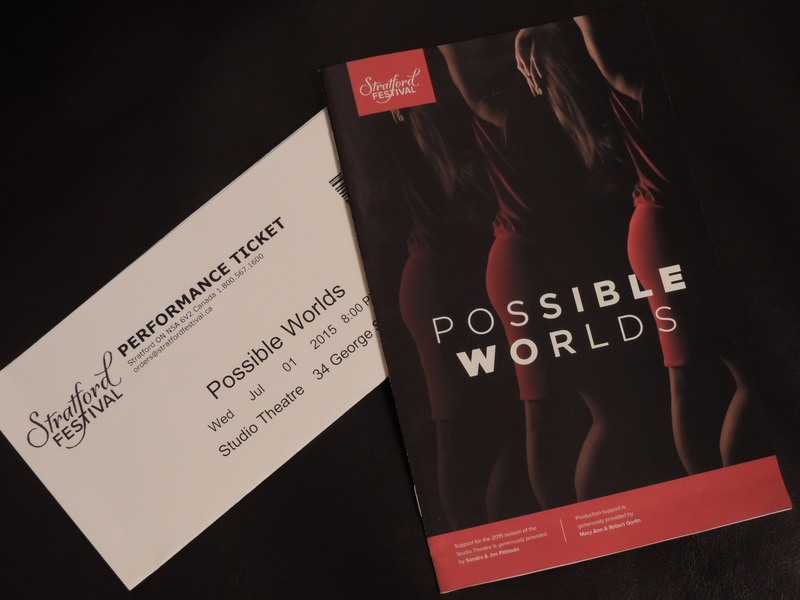 This entry was posted in Live, Reviews, Stratford Festival (Canada) and tagged Cyrus Lane, Gordon S. Miller, John Mighton, Krystin Pellerin, Michael Spencer-Davis, Mitchell Cushman, Possible Worlds, Sarah Orenstein, Stratford, Stratford Festival, Theatre. Bookmark the permalink.